BOSTON (CelebrityAccess MediaWire) — Tickets to Paul McCartney's July 9th show at Boston's Fenway Park sold out in a scant five minutes after going on-sale on Friday, the show's promoter, Live Nation, revealed. According to Live Nation, this marks the fastest sell-out for a concert in the long history of the stadium. 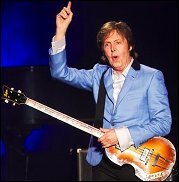 Fenway isn't Sir Paul's only stop in the U.S. this summer and after the sell-out, three additional dates were added to his itinerary, which includes a stop at this year's Bonnaroo. Added dates include: May 22 in Austin, May 29 in Tulsa, and July 12 in Washington, D.C.